Thank you for creating a special piece of jewelry that I was able to really connect with. reminds me that family is the most important thing. helps me connect with my past. a gigantic smile on my face today. and laugh your a** off at her blog. Awww! I'm soooo glad you like it (and please, please tell me it fits?)! Also, how come your pictures of it came out better than mine? LOL! I absolutely ADORE this bracelet that Kelly made! It's gorgeous. I can see why it's so special to you! What a sweet letter you wrote to her! it fits, the chain strand is a bit roomier than the wire wrapped strand. but I think it'll be alright. thanks again, it's stunning in person! I need to shop for some pineapple quartz. LOVE IT! 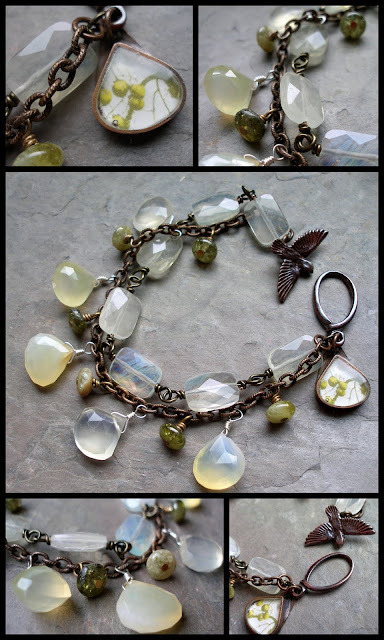 Kelly does such nice work.I love how the pale yellow pieces echo the shape of the Jade Scott pendant. Beautiful. That is such a beautiful bracelet - you lucky girl, Lorelei! And what a wonderful way to say thank you. This is wonderful! Love the matching moonstone and Jade Scott pendant.